If you have an existing PV array and want to add an energy storage system, then integrating an AC coupled solution is the perfect option. It’s simple – AC coupled solutions use a common solar inverter coupled to a battery inverter/charger to manage the battery storage unit. In AC Coupled systems, the DC power from the PV array is first converted to AC by the PV inverter and is then used to power the AC load panel. Any unused energy is directed by an inverter/charger to charge the storage unit. In grid-tied systems, when the grid goes out, the inverter/charger isolates both the essential load panel and the PV inverter from the grid via an internal transfer switch. This allows the PV array to generate power, even when the grid is down. AC Coupled solutions are simple to setup and very powerful, but they are slightly less efficient at charging than DC coupled solutions. However, they are very effective when powering AC loads during the day and are expandable with multiple solar inverters to form micro-grids. Currently, there are several solutions available on the market, but the Schneider XW+ (5.5/6.8 KW) inverter is proven to be the most trustworthy and flexible. When it comes to energy storage units, Fortress Power’s Lithium Ferro Phosphate batteries pair perfectly with the Schneider’s XW+. 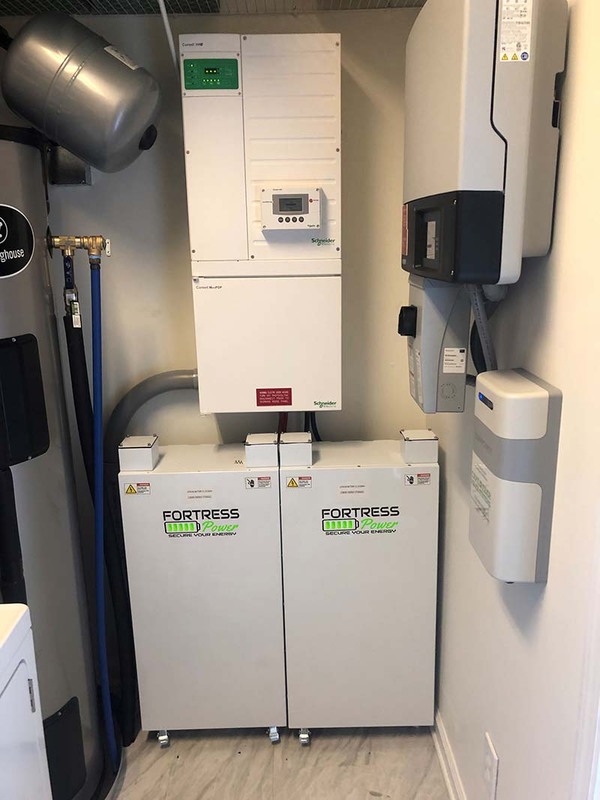 Fortress Power offers two systems, a 10 and 15KWH, which are scalable to 120KWH. This AC Coupled solution is very easy to install, affordable and uses the safest technology available with 6,000 guaranteed life cycles. And perhaps most essentially, the system is Rule 21 compliant and can also be used with micro-inverters to fulfill the module level rapid shutdown requirement.